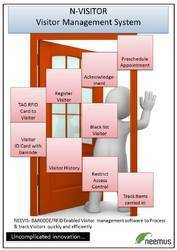 Visitor Management system provides a way to effectively control, record & track your organization's visitor traffic. EASY QUEUE MANAGEMENT SYSTEM is next generation advanced software based queuing system. It automates complete visitor workflow at customer servicing area. It provides all comfort your customers/visitors deserve without any hassels. It can provide vital MIS reporting of your customer/visitors flow. With our vast experience in this domain, we are engaged in offering our clients a wide range of Visitors Management System. Also, these are available within the promised timeframe to the clients. - E-gatepass is an ultimate Automatic Gate Pass System. - System is simple to use & no supervisor is required. - Visitor can simply enter the visiting card & gate pass can be made automatically by using simple touch-screen operation. - While scanning the card the photo of the visitor is also maintained & printed on gate pass. SEED’s Visitor Management System is a reliable and cost effective visitor management application that enables an organization to manage and track visitors throughout its facilities. The Visitor Management Module allows you to welcome and manage your incoming and outgoing planned or unplanned visitor’s. Our highly interactive Visitor Management Solution, is an information hog when it comes to managing and recording visitor data. It can happily handle huge quantities of data and numbers of visitors. Gleeknot Visitors Management System is specially design for company that want to track records of their visitors. Save Visitors data, Track visits, Web Cam photo integration and much more. • Secured entry & exit increases safety and protection of your property and staff. • Enables effective visitor management system through centralized database.